Maya and her friends from coding club have an exciting new project: they're coding lights and music for the winter dance! 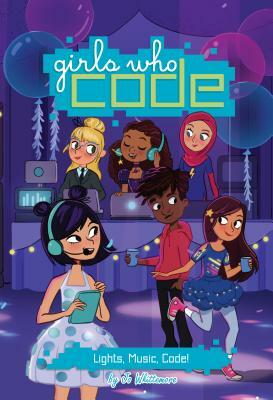 But when Maya's old troublemaking friend Maddie moves to town, Maya starts spending a lot of time with her, and less time with her coding friends. Maddie just gets her in a way that her other friends don't. Will Maya get swayed by Maddie's wayward ways, or will she stay true to her "permanent group" from coding club? And will she come through on her part for the light and music coding project? Maybe coding--like friendship--is about being there for your friends when they need you the most. Jo Whittemore is the author of the tween humor novels, Front Page Face-Off, Odd Girl In, D is for Drama, Colonial Madness, and the Confidentially Yours series. She also penned The Silverskin Legacy fantasy trilogy. Jo is a member of the SCBWI (Society of Children's Book Writers and Illustrators) and is one of the founding members of The Texas Sweethearts & Scoundrels. When she isn't writing, Jo spends her time with family and friends in Austin, dreaming of the day she can afford a chocolate house.